With more than a few Christmases behind me it still surprises me how many toys have stood the test of time. Looking at the top ten predictions for this year there are a few which were probably on my list back in the 60s. Things haven’t changed that much with many of the popular offerings being linked to television programs of the day. Launched in the mid-60s, Thunderbirds was one of my favourites. The story of a secret rescue organisation, with futuristic planes, cars and equipment, helping to prevent many disasters. It didn’t really matter that you could see the strings or that it was filmed in supermarionation. Jump forward 50 years and the best selling toy this year is likely to be the interactive Tracey Island playset. I can’t remember having the island but I certainly had Thunderbird one, Thunderbird Two and Lady Penelope’s Rolls Royce. Why have these toys endured? The versions I played with had very little if no technology, but the look of them really appealed to my imagination. I think it’s the same for most toys. The appearance is the key. Many new products in the toy and game industry are updated versions or variations of pre-existing toys and games. This can make it difficult or impossible to obtain patent protection on the product. However, protecting the design may still be available for the unique ornamental appearance of an otherwise conventional product. For example, with board games, a design registration may be used to protect the unique appearance of game pieces, spinners, timers, and in some cases, the playing board. For toys, a design registration may be available to protect the appearance of an action figure, toy car or space ship. Design registration can be particularly valuable in fighting counterfeits and copies, especially where the main selling factor of the product is its unique appearance. It can also be cost effective, with UK Design registration starting from £60 for your first design and £40 for any subsequent filings. It’s also quick, with most designs being registered within 1 month of application providing there are no objections. Used in combination with other Intellectual Property rights such as trade marks, copyright and patents, designs can be another tool in the armoury of any toy manufacturer. Another in this year’s top 10 and making a regular appearance in Christmas stockings is of course LEGO. Developed back in the 1950’s, the clever interlocking bricks have been with us over 60 years. The name 'LEGO' is an abbreviation of the two Danish words "leg godt", meaning "play well" and coincidentally in Latin means “I put together”. Originally protected by patents (GB908097), now the world’s most valuable toy company, this year’s tie in with the “Star Wars” films will see a range of related products. Since 1999, LEGO have been licensing with major corporations such as Disney, DC and Marvel comics and Lucas film. Although there have been competitors the bricks are made to a very high standard. The margin of error on each brick is an astonishing two microns, or 0.000079 inches (the average human hair is about 100 microns wide). Meanwhile, the plastic used is the same material from which car bumpers are made. The plastic is dyed, not painted, and the mix of ingredients is precise enough to make each brick extremely hard—as anyone who’s stepped on one can tell you. So have a great Christmas, let’s hope Santa brings you something special. Altogether 5.....4.....3.....2....1 Thunderbirds are go! 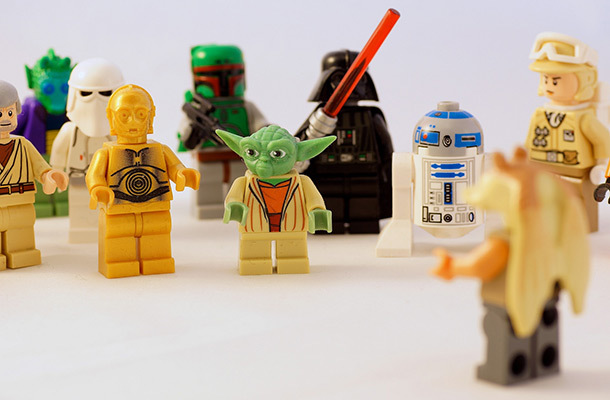 (Photo above of Lego Star Wars figures by Tony Newell on Flickr).